You have to hand it to the missionaries who arrived on Aitutaki in the early 1800s to impose Christianity and erase traditional Cook Islands’ culture. They did a remarkably thorough job. If you ride a scooter around Aitutaki today you’ll see churches of every denomination, the oldest built of white-washed coral and surrounded by graveyards of stone crosses. If you arrive on a Sunday you’ll see villagers walking to church wearing their finest clothes and ‘ei (flower garlands) around their heads. Your flight might even be met by locals protesting against desecration of the Lord’s Day. What you won’t see, however, are the huge carved figures Aitutaki was once known for. The ancient marae are hidden in the bush, overgrown and avoided, their stones toppled. The traditional Polynesian art of tattooing survives but is condemned in Sunday sermons. One man is trying to revive knowledge of the old ways but, in a devoutly Christian country like the Cook Islands, it’s a lonely battle. 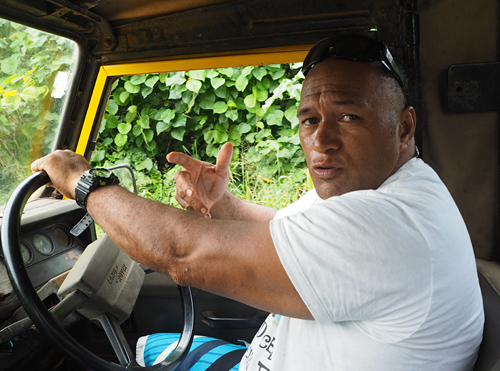 Ngaakitai Pureariki (Ngaa for short) came home from Australia in the early 2000s to reconnect with his culture and land, but his crusade was sparked by a Sunday sermon a few years later. The people of Aitutaki were quick to embrace Christianity because they believed it was the way to a better future, Ngaa says. The missionaries saw the islanders’ carvings as false idols and had them burnt or shipped off the island. They banned the hongi (a traditional greeting which involves pressing noses), ironically because it helped spread diseases brought by Europeans; they also tried, with less success, to ban tattooing. Ngaa among the standing stones of Arangirea Marae. Ngaa, who runs tours of the island’s pre-Christian sites, has no guests booked on the day I visit but agrees to take me to Arangirea Marae, one of eight sacred sites on the island. Ngaa has cleared some of the bush from the stones and carried out an archaeological dig, finding adze flakes, sling stones and skulls. He points out five avenues marked by rocks leading to different ritual areas, while one of his young nephews shows me the stone seat where ta’unga (priests, or tohunga in New Zealand Maori) marked a boy’s coming of age by carrying out a super-incision (a cut in the foreskin rather than a full circumcision). Another puzzle Ngaa is working on is the location of the 32 carved “god figures” recorded on the island before they were removed, possibly ending up in faraway museums and private collections. 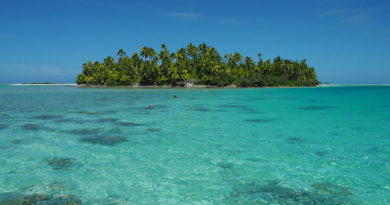 He wants to find them and link them to the surviving chants on the island, which tell of Aitutaki’s history and were committed to memory in the time before writing. 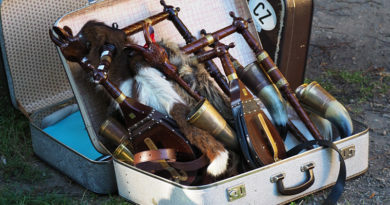 Over the years Ngaa has become an expert in traditional Aitutakian arts and now travels to European museums to identify artifacts in their collections. He has been to museums in Germany, England and Spain; this year he has been invited to France and to Hunterian Museum in Glasgow. 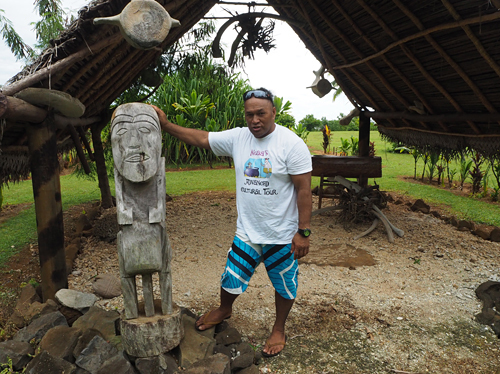 Ngaa with a carved figure of Tangaroa in his replica village, Punarei. The marae is intriguing but the mosquitoes are ferocious so, with a bunch of nieces and nephews in tow, we head to a replica village Ngaa is building on family land overlooking the lagoon. 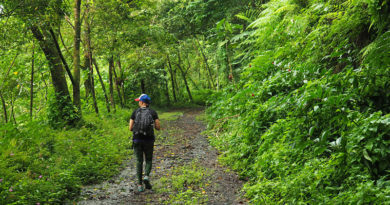 Three days a week he leads a tour around Punarei Village illustrating traditional life on the island, which includes a chance to prepare and cook in an umu using only leaves and other traditional materials. You won’t find any tin foil here, he says. 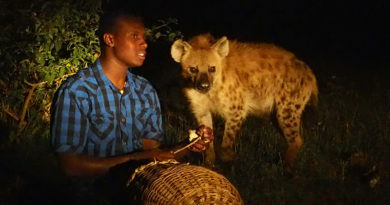 Long-term he plans to build an education centre where local children can learn about their history; he also wants to hold regular culture nights as an antidote to the “fire-dancing rubbish” that is passed off as Cook Islands culture at the island’s resorts. Ngaa realises his mission makes him unpopular with God-fearing Aitutakians, even his own family. While it is tourists who come to see the marae he has freed from the bush, his real target is his own people. 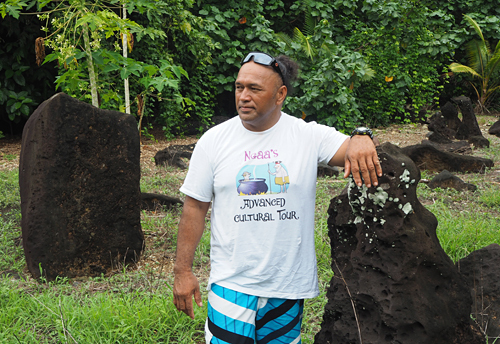 Punarei Culture Tours are held on Mondays, Wednesdays and Fridays. 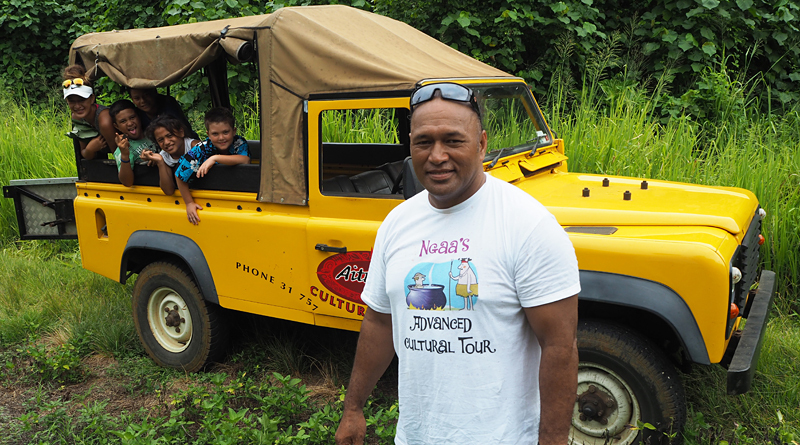 The author was a guest of Cook Islands Tourism.